It's So Easy Being Green: Worth the trip? A couple weeks ago we learned that, not only is there no guarantee that bottled water is any safer than tap water, but also that its production (and disposal, of course) are extremely problematic. Well, a guy who knows what he's talking about, Pablo Päster, a Sustainability Engineer and MBA, has calculated just how problematic the whole enterprise is, specifically by estimating what it takes to produce one liter of Fiji water and get it to the U.S. Taking into account production of the plastic bottle and transportation "just" from China to Fiji to San Francisco (not including additional transportation to Anywhere, USA), the results are mind-blowing. I'm a little rusty on my metric to standard conversions, but luckily Treehugger did that work. Producing that one liter bottle uses up 26 times the amount of water it provides you with--7.1 gallons to be precise, and .26 gallons of oil, and 1.2 pounds of greenhouse gases. Read about it on triplepundit (via Treehugger). Another reason to refill your own bottle. This post reminds me of an article I read on the benefits of buying locally grown food. Much more attention should be paid to the environmental impact of getting your food (and drink) to you. OMG. 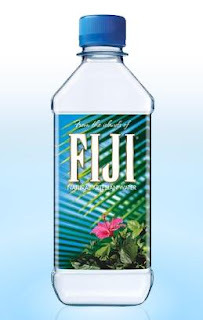 May I never buy another bottle of Fiji water again!! Here's my take on bottled water. The tap water in North America is for the most part very good. We have excellent infrastructures and the water is safe because it is chlorinated. The problem is though that many people don't like the taste of chlorine in their water. In their minds they also frequently equate chlorine with other toxic chemicals. If you held a blind taste test in any major N.A. City and served de-chlorinated tap water VS any brand of bottled water, it would be doubtful that very many people would be able to tell you which was which. From this we can basically conclude that people drink bottled water because of the fact that it doesn't contain chlorine and the fervent marketing efforts of the bottled water companies. Every sport bottle of water you drink is one less water bottle made, hauled, recycled or discarded. Don't forget to run your sport bottle through the dishwasher once in a while.